ANKARA, Turkey Turkey's military chief vowed Wednesday to respond with more force to any further shelling from Syria, keeping up the pressure on its southern neighbor a day after NATO said it stood ready to defend Turkey. 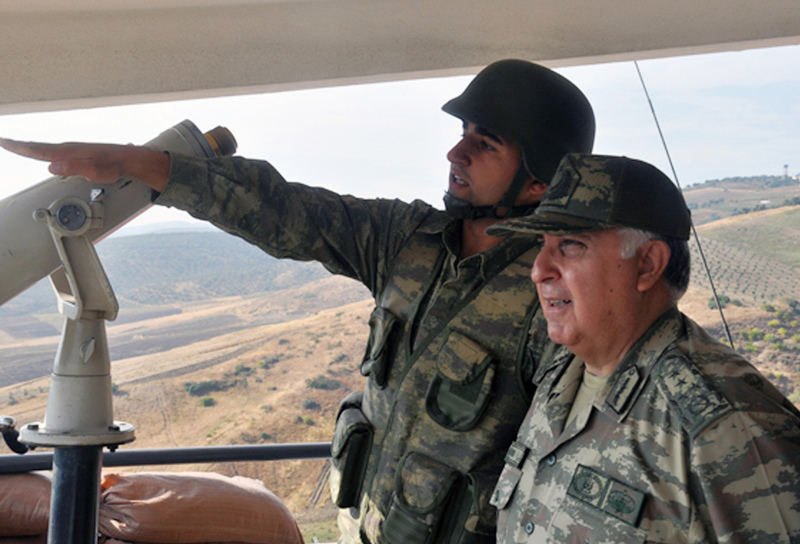 Gen. Necdet Ozel was inspecting troops who have been put on alert along the 566-mile border with Syria after a week of cross-border artillery and mortar exchanges escalated tensions between the neighbors, sparking fears of a wider regional conflict. Turkey has reinforced the border with artillery guns and also deployed more fighter jets to an air base close to the border region since shelling from Syria killed five Turkish civilians last week. "We responded and if (the shelling) continues, we will respond with more force," the private Dogan news agency quoted Ozel as saying during a visit to the town of Akcakale, where he offered condolences to a man who lost his wife and three daughters to a Syrian shell. On Tuesday, NATO chief Anders Fogh Rasmussen said the alliance was ready to defend Turkey, its strongest show of support to its ally since the firing began. The solidarity, however, is largely symbolic. NATO member Turkey has sought backing in case it is attacked, but despite publicly supporting Syria's rebels Ankara isn't seeking direct intervention. And the alliance is thought to be reluctant to get involved militarily at a time when its main priority is the war in Afghanistan. On Wednesday, schools in Akcakale reopened despite the tense situation. They had been closed due to security concerns. Syrian activists, meanwhile, said the rebel units of the Free Syrian Army took control of Maaret al-Numan, a strategic city along the main highway in Idlib province that connects the central city of Homs with northern city of Aleppo and the capital Damascus. Rami Abdul-Rahman of the Britain-based Syrian Observatory for Human Rights said the rebels took control of the city late Tuesday, adding that the rebels control the western entry into the city while the military is massing troops along the eastern outskirts for a possible counter offensive. Fadi Yassin, an activist in Maarat al-Numan told The Associated Press on Skype that rebels are in control of the town, although fierce fighting continued around the military barracks in the eastern part on Wednesday, three days after the FSA launched a "liberation battle," he added. "The city has been liberated," Yassin said of the biggest city in Idlib province with a population of 130,000. "All liberation battles start with small cities and then moves on to the major cities." Holding on to Maaret al-Numan would be a significant achievement for the rebels, enabling them to cut the army's main supply route to two battered cities of Aleppo and Homs, both of which came under bombardment from the regime's helicopters and artillery on Wednesday, according to activists. Turkey's state-run Anadolu Agency reported fighting between Syrian rebels and forces loyal to Syrian President Bashar Assad's regime around the Syrian town of Azmarin, in Idlib province, across from the Turkish border. It said Syrians were fleeing homes in the Azmarin region, some crossing into Turkey on rowing boats over the river Orontes, that runs along the border. Footage from Anadolu showed three young children scrambling down a river bank on the Syrian side before being taken across to Turkey on a makeshift raft strapped to an inner tube. The children said they were fleeing fighting in Azmarin. Private NTV television reported that explosions and automatic weapon fire could be heard in Turkey's Hatay province, coming from Azmarin. It said rebels were clashing with some 500 Syrian government soldiers, and that at least 100 rebels had been injured, some of whom had been brought to Turkey for treatment. Some 99,000 Syrians, mostly women and children, have sought refuge in Turkey since the start of the conflict. Also on Wednesday, state-run news agency SANA said President Bashar Assad appointed Sattam Jadaan al-Dandah as Syria's new ambassador to Iraq. The report did not say when al-Dandah will travel to Baghdad. His predecessor, Nawaf Fares, defected in July to become the most senior diplomat to abandon Assad's regime during a bloody 18-month uprising that has gradually become a bloody civil war. Turkish Prime Minister Recep Tayyip Erdogan, who has been fiercely critical of Assad, said Wednesday that Syria was "the bleeding heart of humanity and the whole Islamic world." Erdogan told a meeting of the Islamic Conference in Istanbul that Turkey had refrained from responding to half a dozen shells from Syria, but when five people were killed last week "we had to retaliate in the strongest way that we could."